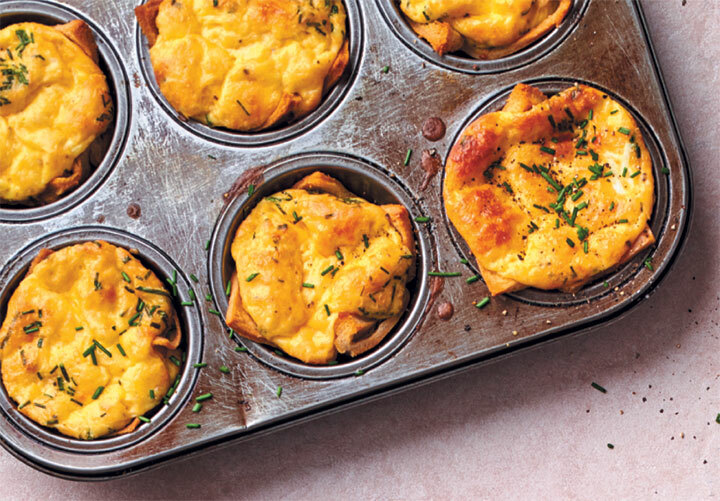 These mini quiches are perfect for breakfast or a quick snack on-the-run! Preheat the oven to 180°C. Use a rolling pin to roll the slices of bread out to about 0,3cm in thickness. Coat one side of each slice with the butter. Use the bread slices to line a 6-hole muffin tin, placing them buttered-side down in each hole. Fold and press the slices to ensure they keep their shape. Set aside until needed. Combine the eggs, milk, cream, seasoning, chives and ½ of the cheese together in a jug. Mix until well combined. Set aside. Divide the remaining ½ of the cheese among the bread cases and top with the egg mixture. Bake in the preheated oven until the quiches are set, about 20 – 30 minutes. Remove from oven and garnish with the freshly chopped chives.